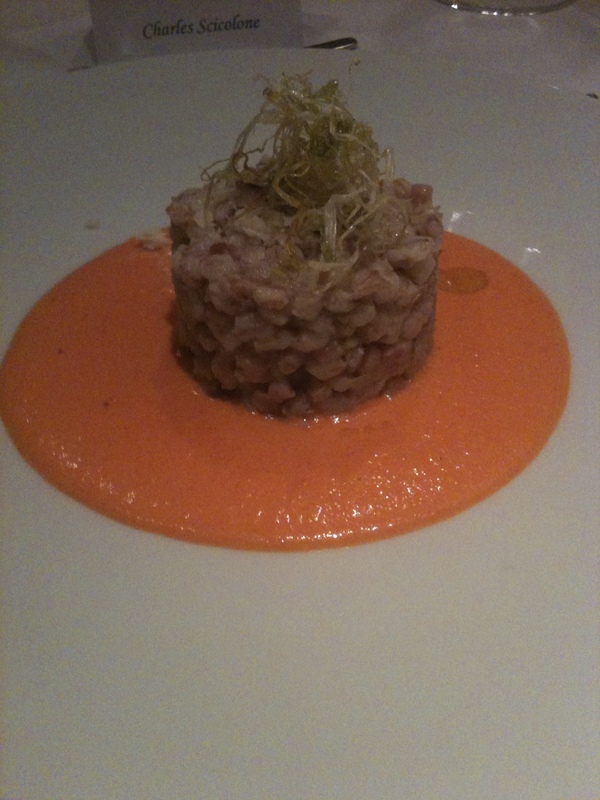 It is always a pleasure to go to Il Gattopardo Restaurant. Recently, I was invited there for lunch for a winery in Bolgheri in Tuscany, I was happy to accept. The Winery is the Campo Alle Comete- -Field of Dreams. The speaker was Jeanette Servidio, Director and General Manager of the winery. Feudi di San Gregorio, a Campagnia winery, acquired Tenuta Campo Alle Comete in February 2016. The property consists of about 17 hectares and is located at the foot of the commune of Castagneto Carducci in the province of Livorno. There are 14.5 hectares of vineyards. Jeanette described the soil as mostly loose sand with some clay and limestone. The land is level just a few meters above sea level. The oldest vineyard was planted in 1993 and the newest in 2007. Vine density ranges from 6,500 to 7,000 vines per hectare. She said the winery practices sustainable farming and in 2016 started the conversion of the vineyards to organic. The new wine cellar with its circular shape is inspired by an Etruscan tomb. It is partly underground which makes it naturally cool. There are 20 stainless steel tanks of different sizes and about 50 barriques/tonneaux in the cellar. Nicoletta Ceccoli, an illustrator from San Marino, has designed the logo and also the dreamlike picture exhibited at the winery, from which the fairy images on the labels have been taken. I was very pleased with how well the wines complemented the food! 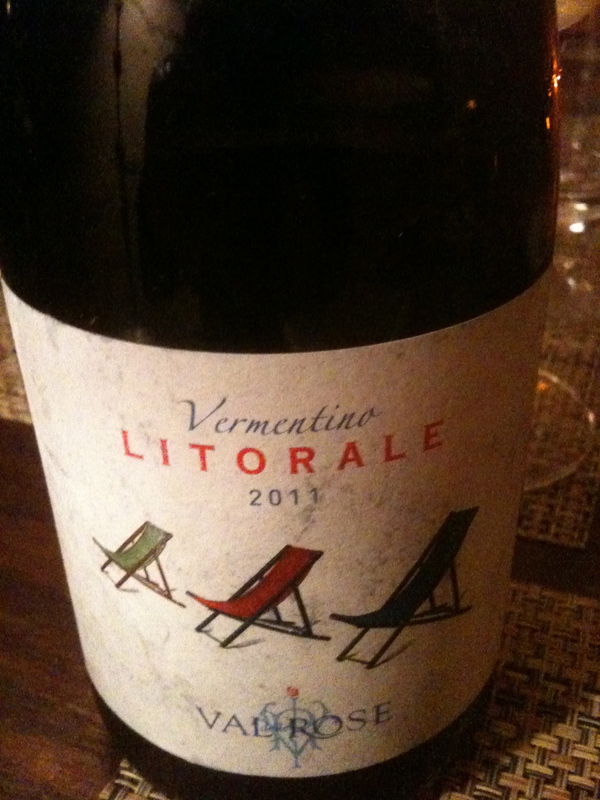 Vermentino IGT Toscana 2016 made from 100% Vermentino. Fermentation is in stainless steel vats at controlled temperature of 17 degrees C then a short time on the lees. 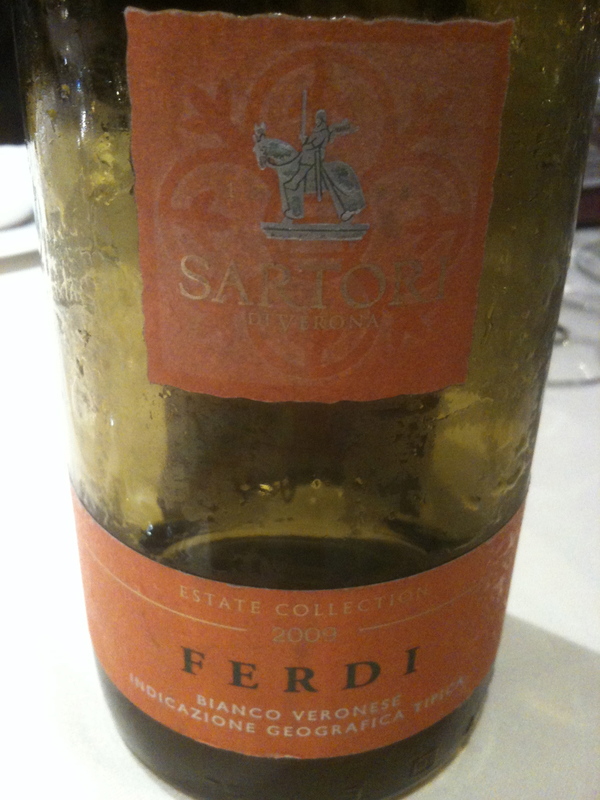 The wine has citrus flavors and aromas with hits of herbs and good acidity. Cabernet Sauvignon IGT Toscana 2015 made from 100% Cabernet Sauvignon. Half of the wine is in stainless steel tanks to preserve the fruity notes; the rest matures for about 6 monts in new and used barriques and tonneaux of medium toasted French oak. The wine has aromas and flavors of red fruit with hits of black cherry and mint. Bolgheri Rosso DOC “Stupore” 2015 made from decreasing proportions of Merlot, Cabernet Sauvignon, Syrah and Petit Verdot. 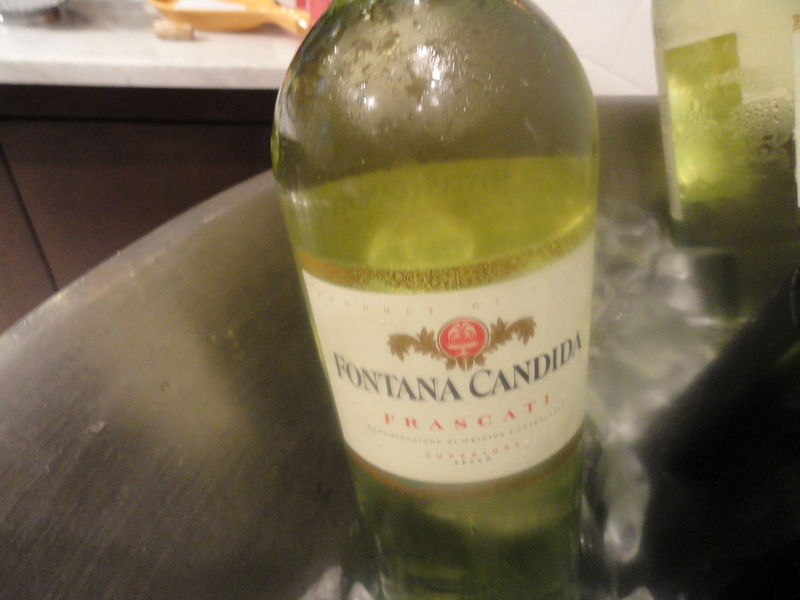 Each grape variety is fermented separately, and the wine remains in contact with the skins for about three weeks. The wine is aged for about 10 months in new and used barriques and tonneaux of medium toast oak barrels. 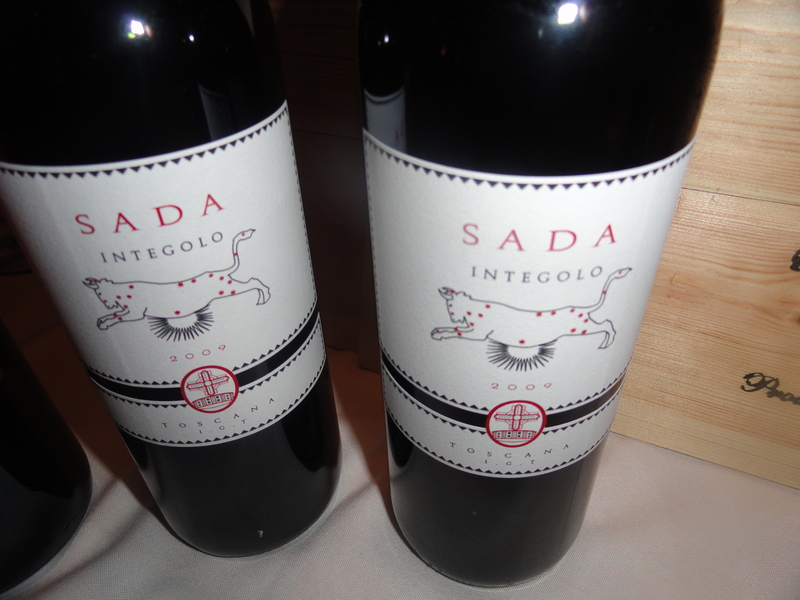 The wine has fragrant red fruit with a touch of balsamic and eucalyptus. .
Davide Sada is a wine lover and always dreamed of owning his own winery. Davide however was involved in the family business; his great-great grandfather had patented the technique of vacuum-canning foods and was the creator of what was to become Simmenthal, Italy’s best-known brand of tinned beef. Sig. Sada at first wanted to start a winery in Friuli, but he changed his mind and his career when he met the well known Italian enologist, Maurizio Castelli, who convinced him to look in the northern part of the Maremma. After a detailed analysis of the land lying between Casale Marittimo, Bibbona and Bolgheri by a geologist friend of Castelli, Davide purchased land that they felt was best suited for growing quality grapes. 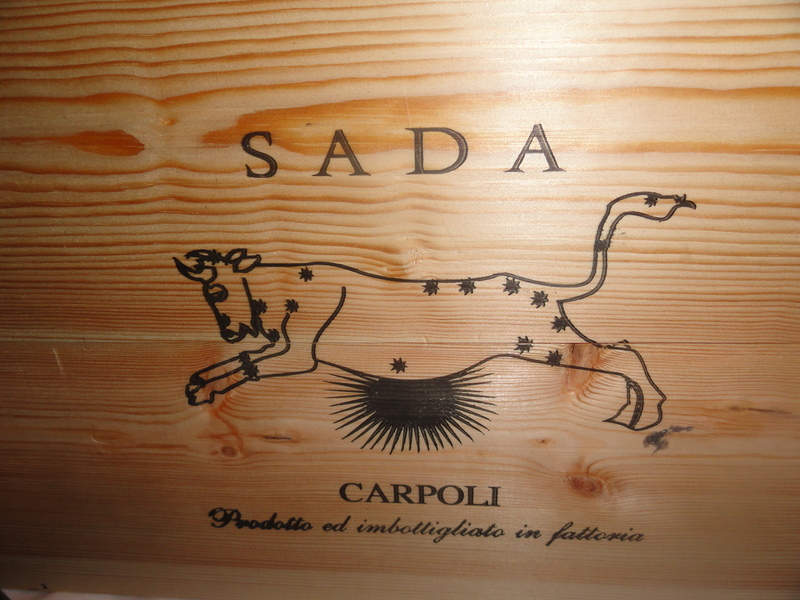 The new winery was named Azienda Agricola Sada – Fattoria “Carpoli”. Recently, at the Hotel Michaelangelo in NYC Sig. 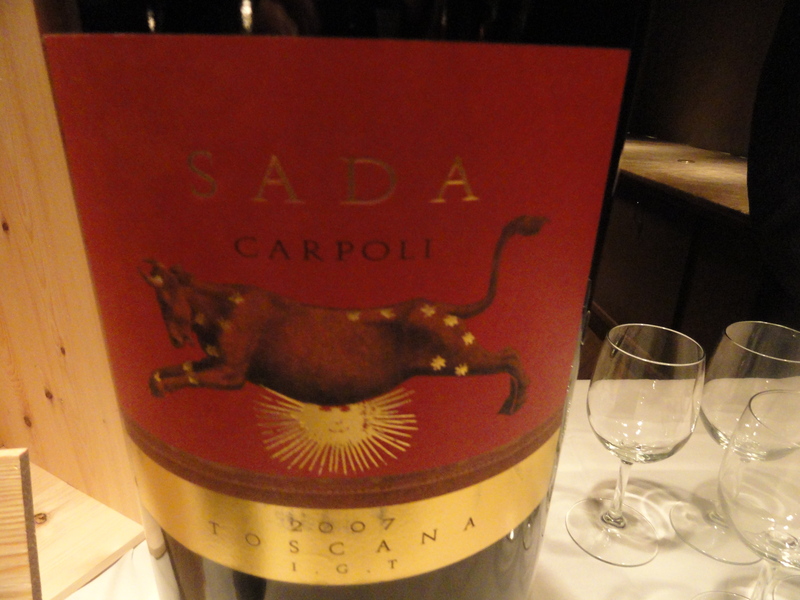 Sada presented his wines at a very special dinner of simply prepared traditional Tuscan food. 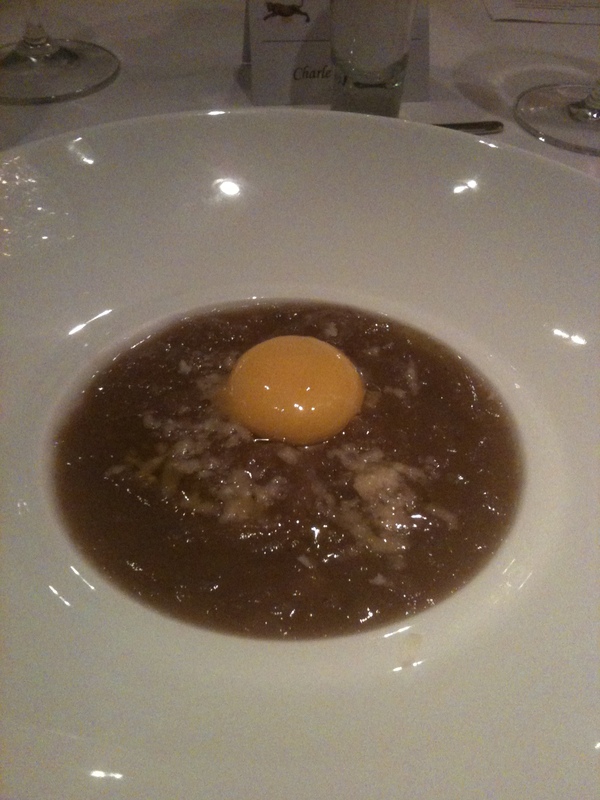 The dinner was prepared by Emanuele Vallini, chef/owner of La Carabaccia in Bibbona, not far from the winery. Sig. 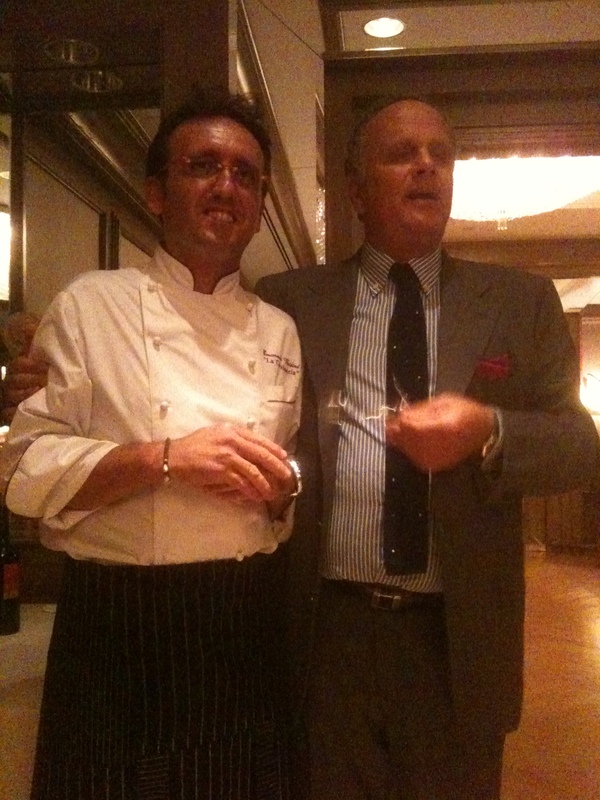 Sada is so proud of the food of this area that he flew Chef Vallini to the US to prepare the food for the dinner. 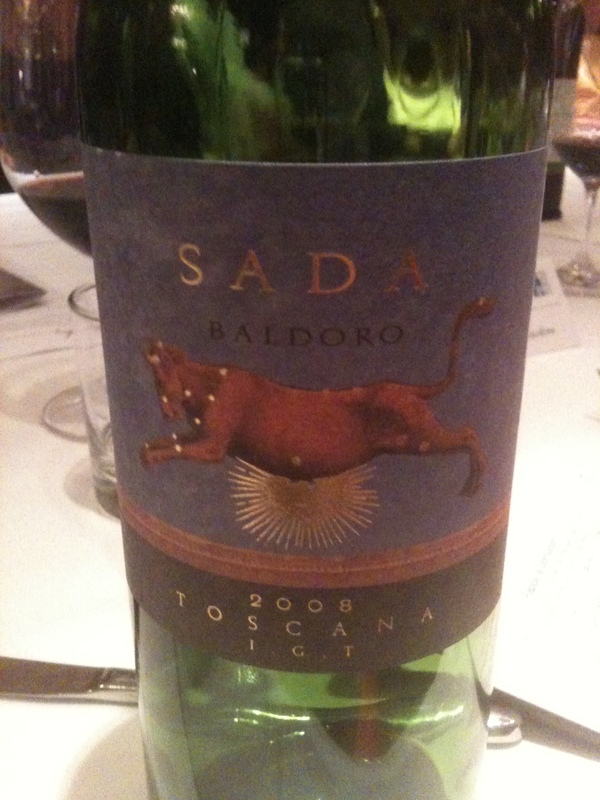 Baldoro Toscana IGT 2008 60% Cabernet Sauvignon, 35% Montepulciano and 5% Alicante. Vine training, altitude, harvest and vinification as above. The wine is aged is stainless steel for one year and in bottle for 6 months before release. 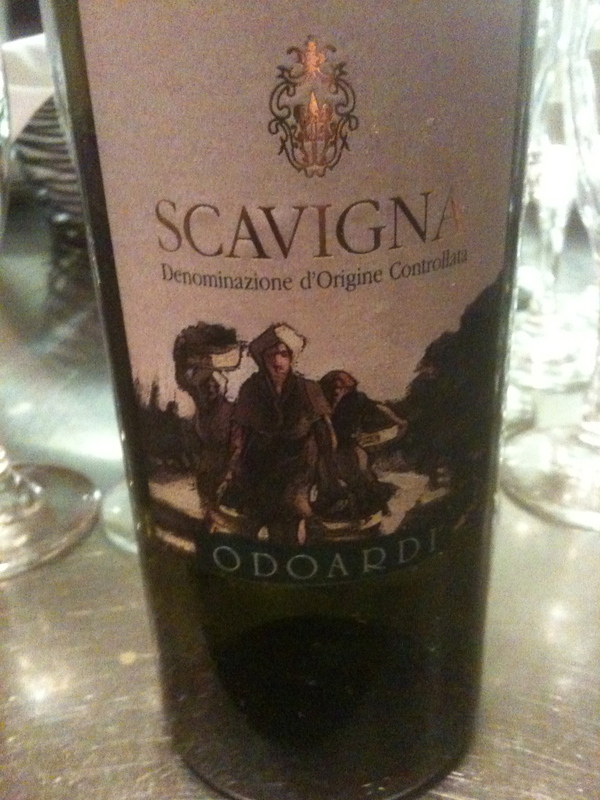 This wine had fruity red berry flavors and aromas with hints of blackberries and blueberries. 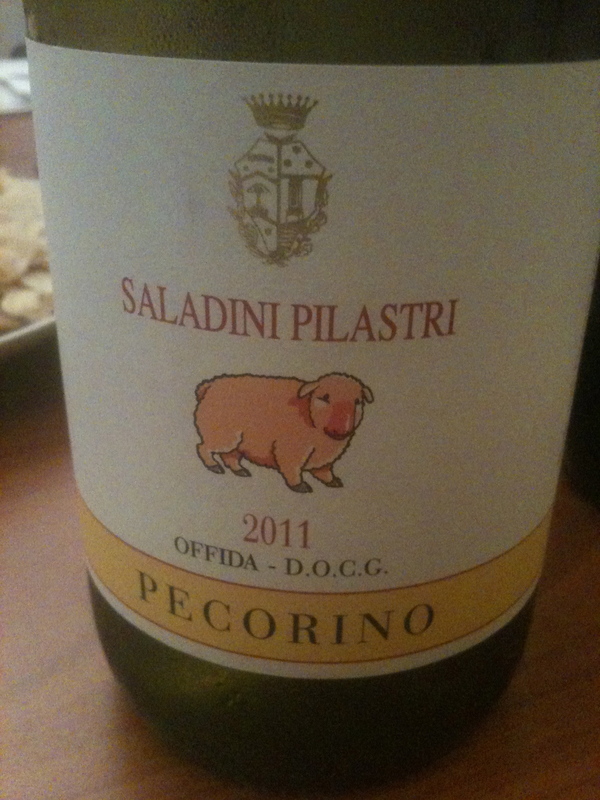 This wine had more body than the Integolo and had a longer finish and more lasting aftertaste. This wine is not for sale at this time and is only made for family and friends. It was dark brown in color, very dense, thick and sweet. However with the dessert crema di mascarpone con sbrisolona di cantucci (cream of mascarpone with crumbles of cantucci) it was a perfect combination. At dinner I was sitting next to Sig. 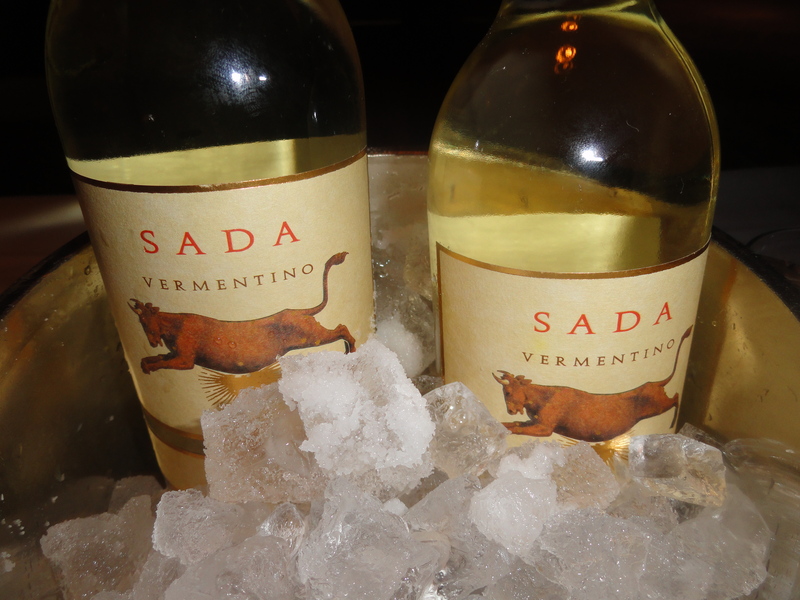 Sada and he said that the winery was organic but he does not put it on the label.